Click on the logo to add points. Watch out youngsters, the Seniors are coming. Agility has been built on the idea that 'agility is fun' but we think it should be changed to 'agility is fun for all.' That's regardless of breed, size or age. The wonderful thing about agility is that it is not just for the youngsters and the fleet of foot. If you can steer your dog around the course, then you have a chance for a place or clear round rosette. We want to recognise those handlers who are no longer young and fleet of foot, and that's why we've started the Senior Agility League (SAL). After all is said and done, age is just a number! Since 1979, when the sport of Agility was introduced at Crufts, it has grown and grown to be the most popular dog activity in the UK. Once addicted, agility people don't seem to retire. They get another dog. They take a joint supplement. If they can't run faster, they learn to run smarter. It's not uncommon now for handlers to still be competing in their 60s+. If you have any questions whatsoever, email the League administrator Ellen Rocco. SAL 2018 is now open for registration. It is not necessary to re-register if you were a member in 2017 or before. Just start adding your points and watch them grow. We are delighted to announce that the Big Dog Bed Company has agreed to sponsor the Senior League again. Instead of traditional trophies, this year Dorset-based artist Ally Tate has created a special, limited edition, signed print for 1st place division winners. 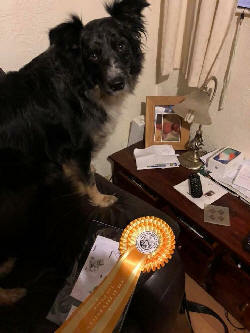 Since getting her own Border Collie and becoming involved in the agility world, she felt it was a natural step to combine the two interests and now has a collection of agility-based work. This year the way that points are awarded is changing. You will now receive the same points for all types of shows regardless of affiliation - KC, UKA and Independent. You will get 22 points for 1st place going all the way down to three points for 20th place. Two points will be awarded for clear rounds, but they must be within course tie. See the Points Table below. We are continuing to look of the site to make it more mobile and tablet friendly so it is much easier to put your points in on your phone. Thanks to Agilitynet and the Big Dog Bed Company for sponsoring the Senior League. Bailey is my first agility dog and last year was her first year of competition. Thrilled and proud to have won1st place in Large Gold group. It may be her last rosette as she has been diagnosed with hip dysplasia but what a good year we had! WOW! Thank you so much Agilitynet for running the Senior League. with Jenny's Nessa and my Jack, in the Senior League Ruby Division Large for 2017. The rosettes for the Senior League are just fabulous. We managed a 3rd in the Ruby section. Thank you so much to Agilitynet for organising and to The Big Dog bed Co for their generous sponsorship. Once again Jacky Oriss and the amazing Oh Ted! topped the Senior Agility League (again), winning the Allsorts category with a stunning total of 4647 points. Ted is now 10 and slowing down a bit, but he is still ran away with the 2017 Senior League. Jacky said, 'Ted is 10 now and slowing down but he is still a, I am sure going to miss him when he is no longer around. You are right he is a star, I had no idea how much my lovely red pup would become such a friend to me, and we would share so many many happy times together. He is a real a star and I am proud of his achievements along with his 101 bablies, grand and great=grand babies. 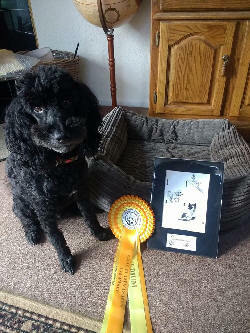 Ted becomes our first nominee for the newly created Senior Agility League Hall of Fame. 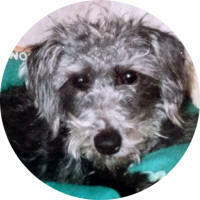 Our second nominees are Jennifer Rothwell and her Bedlington X Poppet. This pairing has often been in the places in the League and we would like to recognise their achievements. 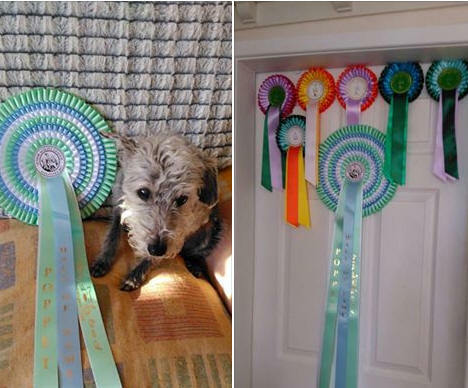 Both dogs have received amazing (and enormous) rosettes marking their achievements. Please note that by submitting your application for the Senior Agility League, you are agreeing to the rules below. 1. The Senior Agility League (The League) is open to handlers aged 55 years and over on 1st January in the current year. 2. Dogs entered in The League must be registered with the Kennel Club. 3. The League will run from 1st January to 21st December in each year. It will re-open on 23rd December. Points from shows between 22nd December and 31st December can be carried forward to the next year. 4. The League is organised in four main categories based upon the age of the handler on 1st January with three sub-categories in each according to size (Large, Medium & Small). 5. Points can be claimed from places and clear rounds from open classes at all shows but not qualifiers, club matches, leagues, fun days or simulated/training in the ring shows etc. 7. When claiming points, the show, day (optional), class and place must be stated. The administrator reserves the right to assess if the show is eligible under the above guidelines. 8. 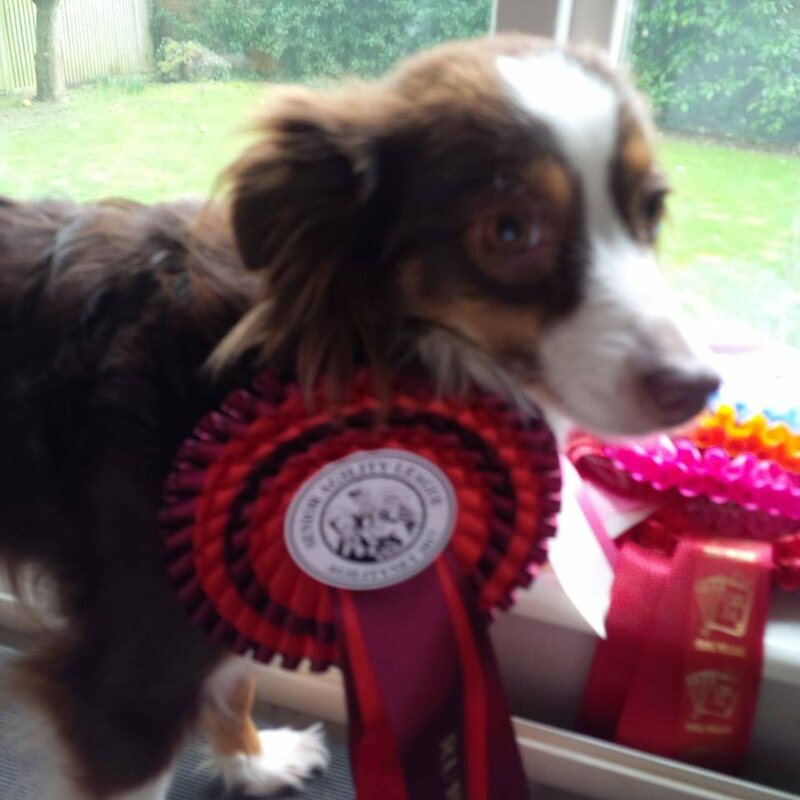 Placed points can only be claimed if a placed rosette is presented by the show. Otherwise, clear round points only can be claimed. Clear round points can be claimed even if clear round rosettes are not given by the show but must be within the course time. 9. Placed points can be claimed for all Standard 'singles' classes including Championship qualifying rounds (but not the Final or Semi-Final) as well as Helter Skelter, Gamblers, Snooker, Steeplechase and other 'special' classes. Points may also be claimed for UKA Masters Combined result but not the individual rounds. 10. 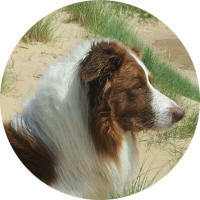 The Dog will remain in the category/level it starts in on 1st January for the duration of that year. If a dog transfers to 'Allsorts' during the year, please contact the administrator. 11. The Handler/Owner must update registration each year. 12. The Handler/Owner is responsible for changing the categories if required, when starting the year. 13. It is the Owner/Handlers responsibility to send their points via post or submit points on-line. 14. There is no time limit to claim points, although we would ask that you try to do so on a monthly basis. 15. Final results for the year must be received by 21st December of the current year. The winners will be announced on Agilitynet and Agilitynet Facebook. 16. Points claimed for the combination of dog and handler cannot be claimed when run by another handler, even if registered with The League. 17. Allsorts dogs are welcome to join The League. Only points from special classes such as Anysize, Allsorts and Veterans can be claimed. Allsorts points cannot be used in the 'main' League. If a dog moves to Allsorts mid-year, points cannot be transferred from Standard classes. If no places are awarded by the show for the class, clear round points can be claimed. 18. It is not necessary to re-register each year if the Handler participated in the League the previous year. * Clear rounds must be in time. Q, How soon should I add my points? Q. Some unaffiliated shows allow dogs to run at their own level rather than the level of the handler. For example, when dogs are KC Grade 3 but are allowed to run in Elementary under a different organisation. Can you claim these points? Q. I have won out. Do I need to change my Grade? A. No, your dog remains in the category it started in January of the current year for the duration of the year. Q. What system should I use to calculate points from a KC Limited show? A. The points are the same as a KC Open show, Unaffiliated shows have different points values. Click here to see Points Table. Q. Why does my dog have to be registered with the Kennel Club? A. The League needs set a criteria to work with such as levels, heights, recognised breeds etc. Q. Do wins / places have to be clear rounds to count or can faults be involved? A. A place is a place. Claim it. Q. When I try to register or add in points, I keep getting sent back to the Login screen. What do I do. A. Click here for help. It's all about cookies - and not the eatable kind. Q. As a resident in N Ireland, I frequently compete in the Republic of Ireland under Irish KC rules and regs. Do wins under IKC rules count and if so, in which category -- KC or unaffiliated? A. 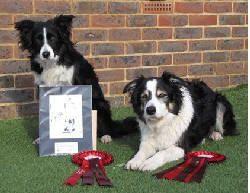 As the Two Kennel Clubs have similar standards - rules and regs, your points would count as KC. Thank you to John Ward and the DARL Rescue League for their help with the League Tables.